Swimmin' & Dancin' - You don't know me. Oh and did you know Barack Obama can dance? And then they saw him... Bush in a speedo! I don't usually watch Ellen (although i love her) but i did yesterday and there was this 8 year old boy who'd written a book on relationships, and he was ADORABLE and she read part of the book and it was so funny... she got him an interview or something with harper collins, and i hope it gets published...it was supersweet. 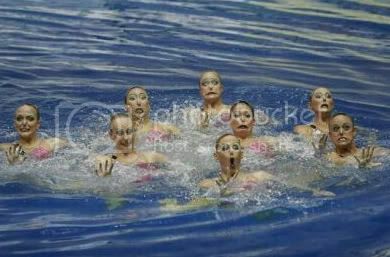 "The Ladies' Synchronized Swimming Team realized they shouldn't have had that second helping of chili last night." The first annual Sweet Transvestites from Transylvania Synchronized Swim-off was slightly marred by the frigid water, brought on by the as-yet chilly weather of March. It quickly became apparent that someone had peed in the pool. The B man already had my vote... but, that seals the deal! That's awesome! After agreeing to act the parts of "the swimming ladies" in a new film, the women soon remembered that they didn't actually know how to swim. "And suddenly the name 'Polar Bear Plunge' seemed especially accurate. But then, hindsight IS 20/20." In celebration of the 25th anniversary of thriller, the ladies decided to put their own twist on it. Haha!! Looks like you're on the same path as a previous poster. That's awesome.